How effective is good enough when it comes to major incident management? Looking at the results of a 2018 survey of 767 IT professionals, it’s clear that organizations can respond well to major incidents with varying levels of system automation. But to be a true leader in major incident management, organizations must leverage automation and integrate key systems to accelerate processes. Besides the time, effort, non-compliance fines, and reputation costs, infrastructure downtime averaged more than $8,800 in lost revenue per minute in 2016, according to the Ponemon Institute. 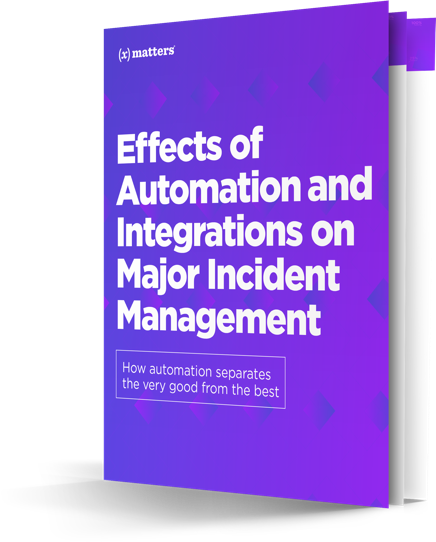 Read the new xMatters guide, Effects of Automation and Integrations on Major Incident Management, to learn how finding the right level of automation can make all the difference for your business.